Having in the past wandered around the Shakespeare and Renaissance section of the British Library’s Discovering Literature website, I was delighted to be invited to write an article on Behn’s The Rover for their new Restoration and Eighteenth Century section. To me it is excellent news that the British Library has expanded its online teaching resources into Behn’s period, and I greatly enjoyed the chance to pitch my favourite Behn play to the anticipated ‘A-level student and general public’ reader. The article draws on the work I’ve completed when editing The Rover for volume IV of the project’s forthcoming edition of Behn’s works (for CUP, scheduled for publication in 2020). I position the play in some of its key cultural contexts, and explore a little of its performance history both in 1677 and into the eighteenth century. The article includes information on the significance of the play’s setting in Naples, Italy; on stage courtesans; and on the English laws and conventions governing women’s place in society. I also address Restoration conceptualisations of masculinity and (of course) ideas of carnival. Part of the delight – as well as the challenge – of writing for Discovering Literature is the need to construct an argument that is punctuated by frequent links to images and existing articles held within the British Library holdings and website archive. The benefits are enormous when used effectively – as I believe they are here. Linked resources in the BL piece include an article by Matthew White on ‘The Turbulent Seventeenth Century’, another on an engraving of Charles’s execution; a link to Coryate’s Crudities (1611) with its opinions on Italian courtesans (with connections to Othello and The Merchant of Venice); and the opportunity to explore Mary Astell’s Reflections upon Marriage (1700). Some of these links were my suggestion, and others were proposed by the Discovering Literature editors drawing on their detailed knowledge of the BL catalogue, and their understanding of the enterprise as a whole. 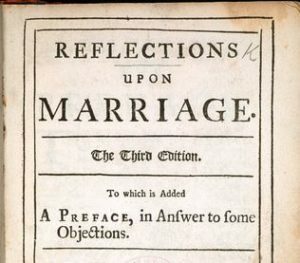 Title page from Mary Astell’s Reflections upon Marriage (1700). From the British Library collection (Public Domain image). My favourite enhancements to the article are photographs from the Royal Shakespeare Company’s glorious 2016 production of The Rover – directed by Loveday Ingram. Joseph Millson’s won Best Actor award for his portrayal of Willmore (see Billington’s favourable review in The Guardian). Also enlightening are the images from the Senate House Library’s copy of the 1677 Rover, which the British Library provided so that I could discuss its use as a prompt-copy for early eighteenth century performances of the play. It shows that cuts were made to the play for this performance; most notably, an example where a speech by the courtesan Angellica Bianca was deleted at the end of a scene, resulting in an increase in Willmore’s standing and a decrease in hers. Like all Discovering Literature articles, my introduction to The Rover is freely available under a Creative Commons Licence. I very much hope it will help to attract yet more readers and directors to Behn’s fascinating, funny play.